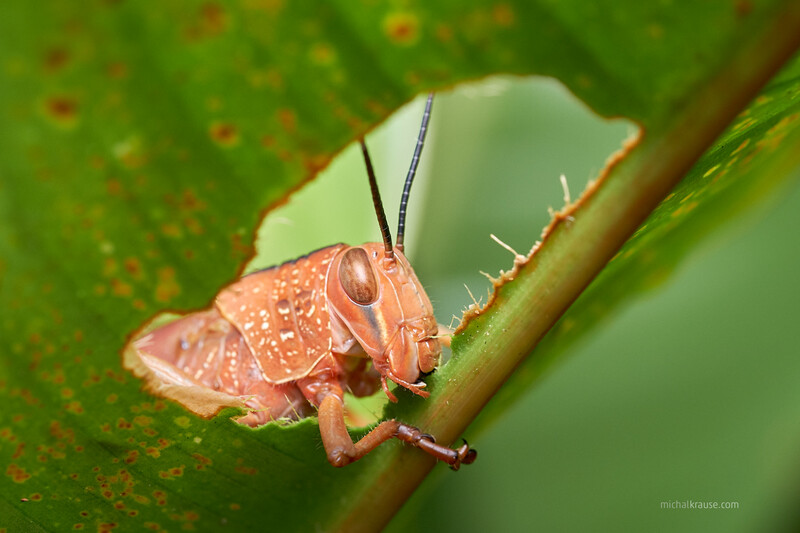 Fujifilm lent me Fujinon XF80mmF2.8 R LM OIS WR Macro for my recent expedition to Australia. Here is my experience with this lens. Fujifilm X system started with three lens and one of them was actually macro lens, Fujinon XF60mmF2.4 R Macro – but it was limited to 1:2 ratio, which was a issue for many photographers. Although there were rumors about 1:1 lens for a long time, we had to wait 6 years for it or use some of third party lenses. 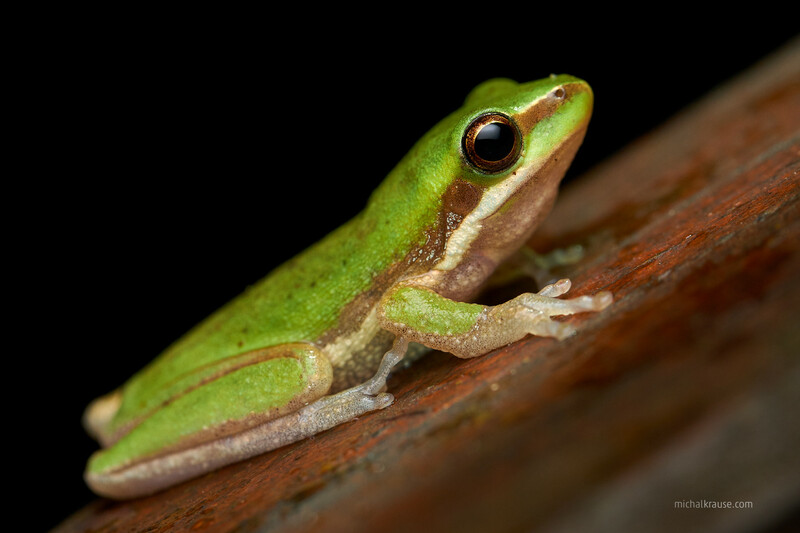 Now the wait is over and macro enthusiasts can go with Fujinon XF80mmF2.8 R LM OIS WR Lens. Lets take a look on it. Fujifilm decided to use focal length of 80 mm and it seems to me as reasonable choice. Minimal focusing distance is 246 mm and working distance (from front element to subject) is 98 mm. I used this lens for capturing insects, frogs and small reptiles and working distance was OK for me, but your mileage may vary. It may be better to have a bit longer working distance for some shier animals, but on the other side, longer working distance makes more difficult to work with flash which is used in macro work quite often. Sure, you may have different needs depending on your subjects and workflow. I must mention optical stabilization, because it is really helpful in macro photography and moreover, it is first prime Fujinon X lens equipped with OIS which was used only in zoom lenses before. In this case, stabilization achieves 5-stop according to CIPA standard, but I have to say that it depends on shooting conditions. It is not uncommon that you take really complicated positions during shooting macro handheld – the more you bend, the harder it will be to stay stable and even OIS will not help you. I was able to get sharp shots using 1/15 s in quite difficult positions. Longer times would be possible in more stable poses (or with X-H1 camera which has in body stabilization) , but it seems to me that you can achieve full 5 steps (which corresponds to shutter time around 0,5 s) more likely in non-macro range. But OIS definitely helps you to get sharp shots and I was happy to have it in XF80mm. 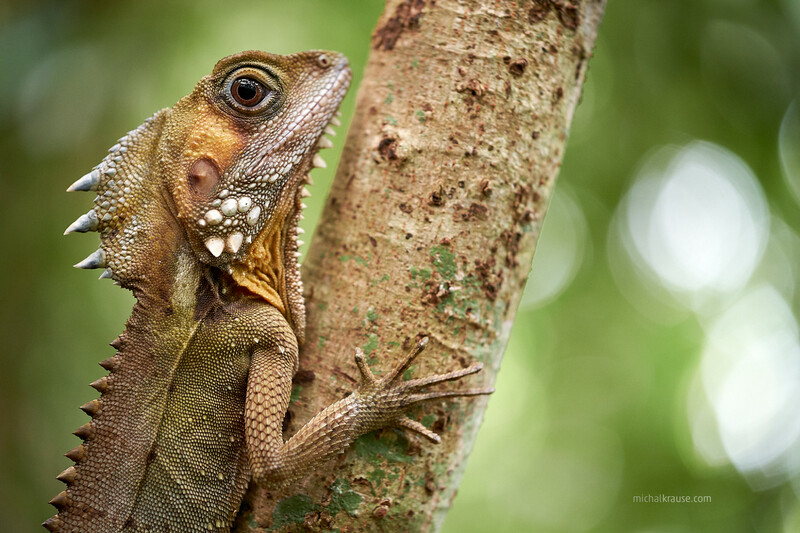 Boyd’s Forest Dragon – portrait of a little bit bigger animal shows out of focus background rendering (and usefulness of stabilisation). 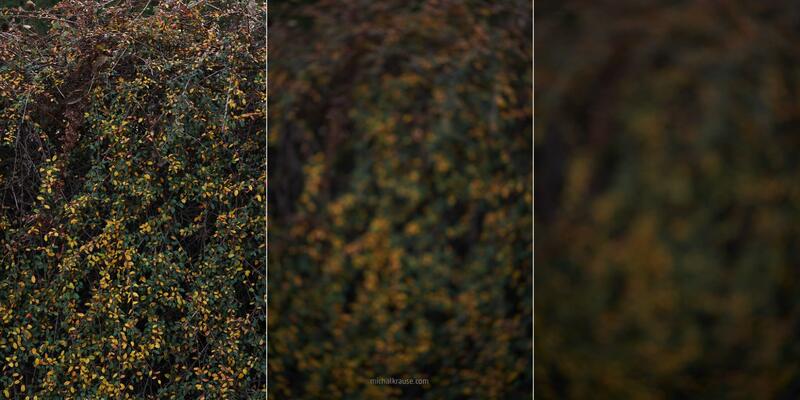 If you find some imperfections of this lens, it won’t be in sharpness – it is awesome. 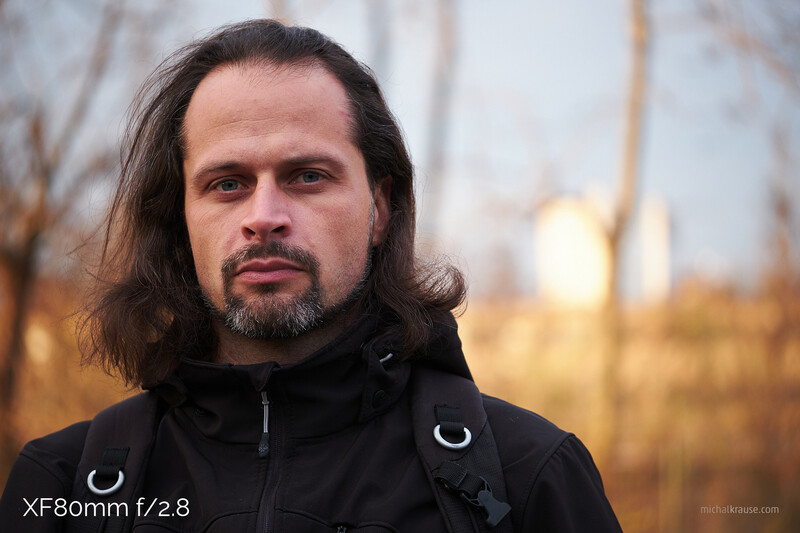 Some reviewers talk about sharpest lens for X system or consider it too sharp for portraits. I think that it is always easier to soften photos than make them sharper :) Sharpness of this lens is really wonderful and it is no surprise for me – Fujifilm knows how to do great lenses and macro lenses stand out usually. 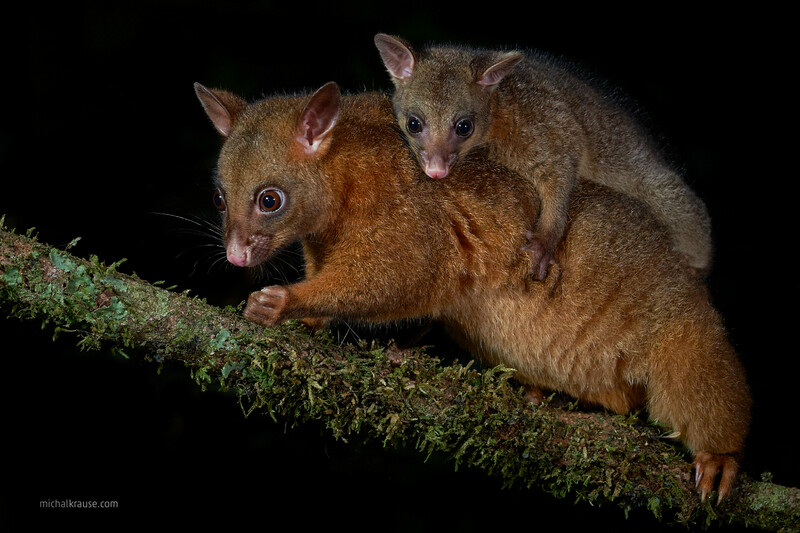 Night visitor of our accommodation – Common Brush-tailed Possum (female with young). As you can see, this lens is really sharp. Another important thing is rendering of out of focus areas. In macro range (where we fight with narrow depth of field) the background is smooth and beautiful typically. Please, excuse slightly different light and composition – I made these photos alone on the street using a mobile application and I had to move camera to achieve similar composition with shorter lens. 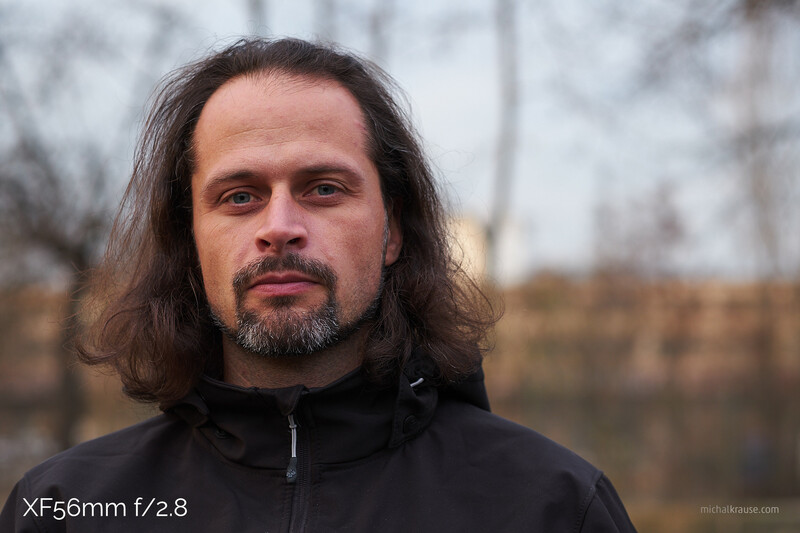 I hope, it still could work as demonstration of XF80mm wide open portrait and comparison with faster XF56mm lens. In terms of build quality, the lens is well made. Focusing ring runs smooth and works well for manual focusing. Autofocus is fast and quiet and you may use focus limiter with options for macro range from 0,25 to 0,5 meters, normal range from 0,5 meters to infinity and whole range from 0,25 meters to infinity. What can surprise you is element in lens which moves freely when lens is not attached to body. When you turn lens upside down, you can hear and feel movement of some not so small part inside lens. It is a bit worrying, especially because it occurs even if you switch to playback on camera, but it is normal and intended by Fujifilm engineers who probably know what they are doing :) For that matter, XF90mmF2 R LM WR lens behave similarly. But back to build of XF80mmF2.8. The lens is weather and dust resistant so with X-T2, X-Pro2 or X-H1 it can be used in harsh conditions. During our Australian trip, we stayed for nine days in area with humidity so high that even items stored in bags turned wet after few hours and the lens worked perfectly. What I find interesting is the ability to use existing XF1.4X and XF2X teleconverters. They are not usable with other prime lenses because they don’t fit mechanically – rear lens element would hit front TC element. Teleconverters can be used for reaching higher magnification ratio (1.4:1, respective 2:1) or longer working distance. Unfortunately, I didn’t test these combinations so I cannot comment impact of converters on optical quality or functionality. My main (and only) reservation about this lens is its weight and size. I am trying to keep my gear minimal in terms of quantity and total weight and size. XF80mm lens is as big as its full frame counterparts – it is similar to them in term of dimensions and weight. For comparison, Nikon 105mm f/2,8 G AF-S weighs little bit more (790 g), while Canon EF 100mm f/2.8L Macro IS USM is even lighter – it weighs 625 g only. 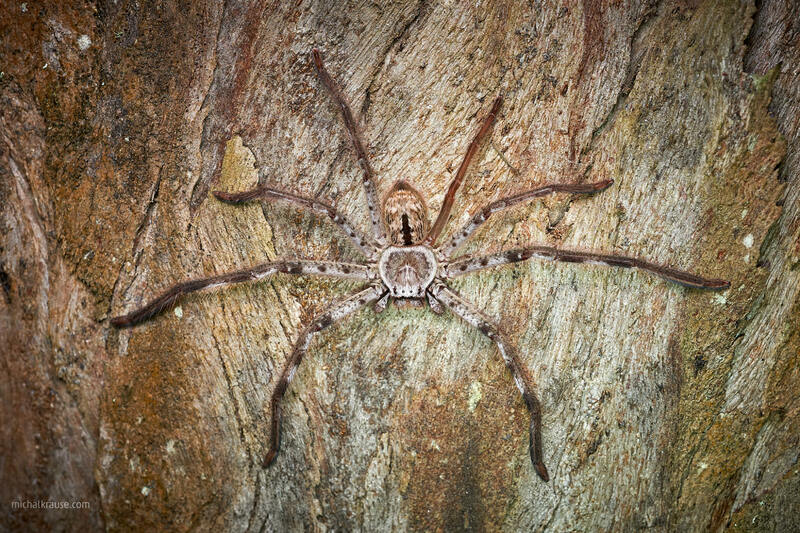 Grey Huntsman is not a typical macro subject – its legs span can reach 23 cm. This individual was smaller, but it is still Goliath of spider world. Shooting with XF80mmF2.8 macro lens was pure joy – it is really sharp, it can reach 1:1 magnification (or higher with converters or other accessories), OIS is a big advantage and it focuses fast and quietly. I am not a big fan of swirly bokeh, but I have to say, that it took some effort to show you this effect – it is not visible in many common situations. To buy or not to buy this lens? The answer is simple: if you focus on macro photography, this is the best choice at this moment in my opinion. Had it not been for my plans to focus more on wildlife of colder areas after three trips to tropical forest last year, this lens would find its place in my bag (with gritting my teeth because of its weight). But I will be shooting macro occasionally and thus XF60mmF2.4 lens will fit my needs for this year – it is really tiny and lightweight (it weighs 215 g only!) 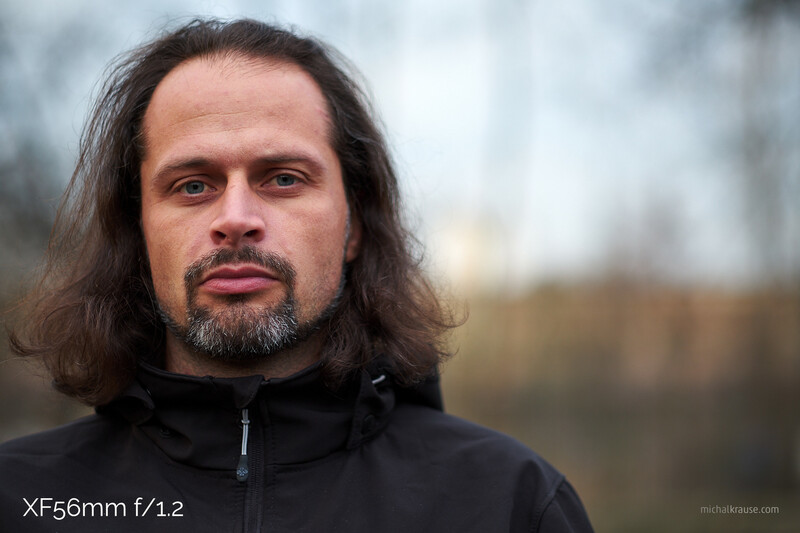 and its focal length perfectly complements my other lenses – XF16mmF1.4, XF23mmF1.4 and XF100-400mmF4.5-5.6. I would like to thank FUJIFILM Europe GmbH for lending me the lens. 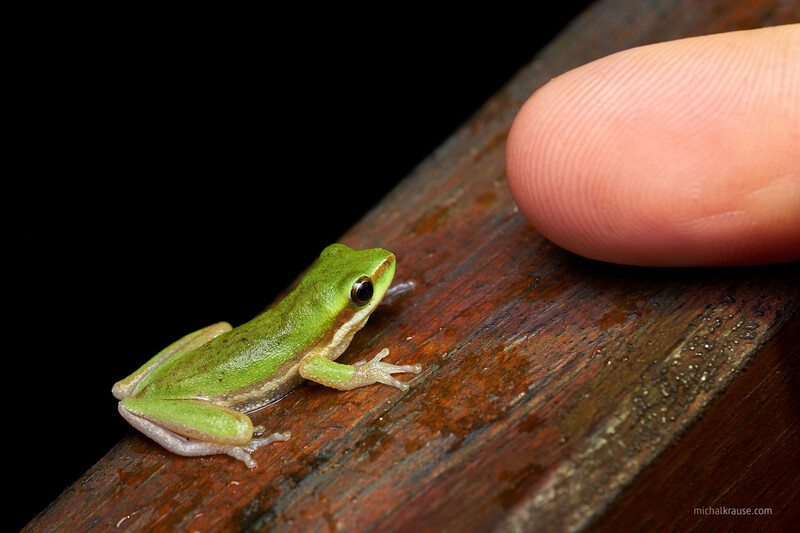 There are many misconceptions of an impact of sensor size in macro photography. Here are some informations, whose may make it more clear. Impact of sensor size and same reproduction ratio on resulting photo. Green rectangle represents full frame sensor and yellow APS-C sensor. 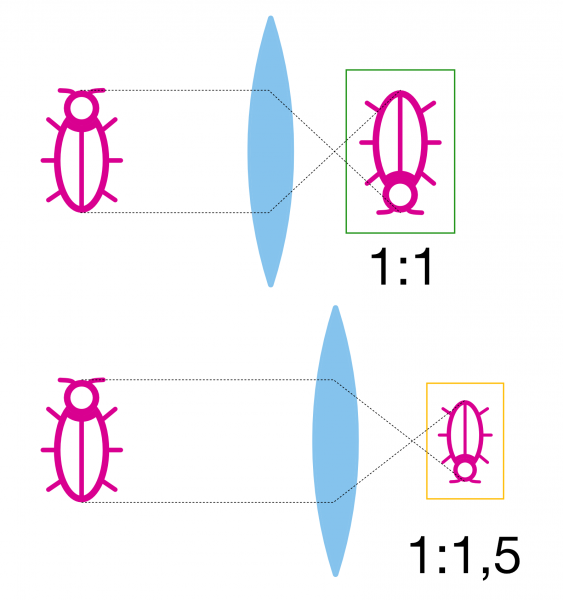 As you can see, if you use lens with the reproduction ratio 1:1 on both cameras, the same object fills frame differently – our bug fits into full frame photo, but it is cropped on APS-C camera – we can say that we can capture closer detail with smaller sensor. As you can see, smaller sensors can be convenient when you want to achieve relatively higher magnification – or simply said, if you want to fill whole frame with smaller subject. Or vice versa, we can say, that XF60mmF2.4 lens mentioned earlier with magnification limited to 1:2 can fill whole APS-C frame with object 48 mm long, which is only about 1/3 more than 1:1 lens can achieve on full frame. You may oppose, that it is possible to achieve the same result by cropping resulting photo and it is true – to same extent. The problem is, that you lose lots of pixels by cropping to the same size. Crop factor 1.5 means that final resolution lowers by factor 2.25 (1.5 × 1.5 = 2.25), so to get 24 megapixels after crop like X-T2 have, you need 54 megapixels photo from full frame. 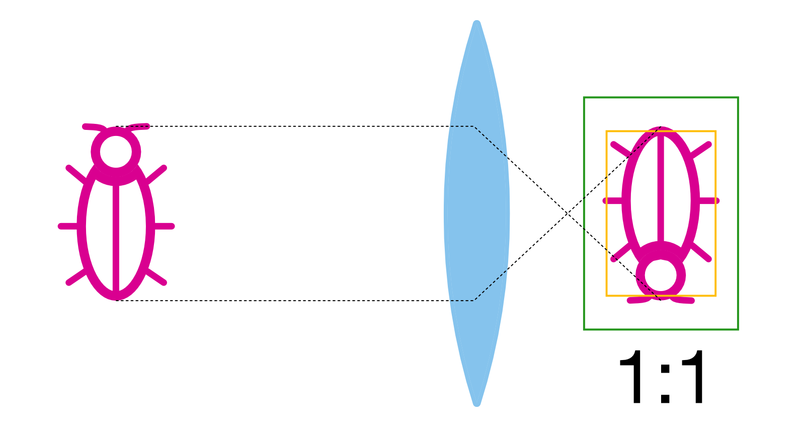 Comparison of reproduction ratio for getting the same field of view on cameras with different sensor size – if you shoot with APS-C camera (bottom) from a bit longer distance with magnification corresponding to crop factor, the field of view will be similar to the field of view of 1:1 ratio on full frame and depth of field little bit higher. 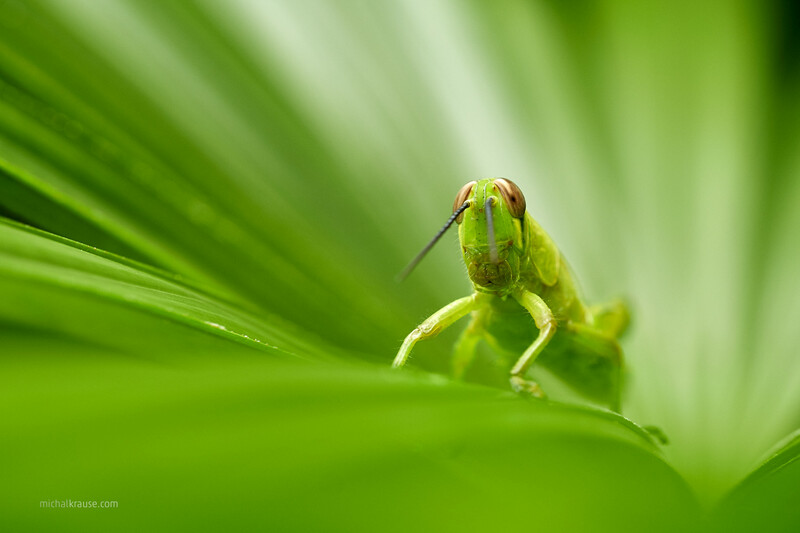 For these reasons (the possibility of capturing closer details and relatively higher depth of field), some macro photographers may prefer APS-C cameras. Posted in Equipment and tagged Fuji.